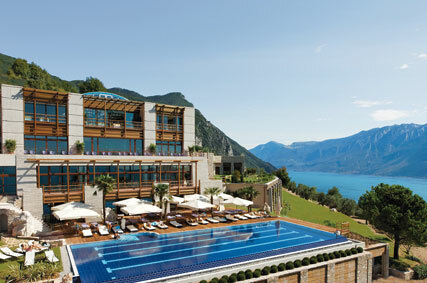 Nestled amongst olive and lemon groves in the rolling hills that surround Lake Garda, the Lefay Resort and Spa is a little piece of Italian paradise. After a final steep, twisting ascent up the hills of the Riviera dei Limoni we let out an audible gasp as we reach our destination. Our local driver chuckled. 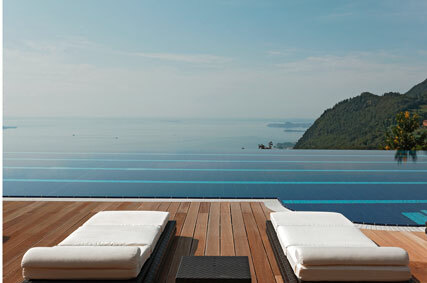 Apparently gasps, screams and even a couple of tears of joy are all common reactions to the sheer beauty of the Lefay Resort and Spa. Overlooking the stunning, shimmering blue lake and the picturesque little village of Gargnano, the resort is set amongst 27 acres of the Alto Garda National Park comprising of natural olive terraces, lemon groves and woodland. Greeted with a refreshing welcome drink and hot hand towels we sat on the terrace while our eyes absorbed the amazing views and we felt our stressed out limbs immediately relax in the warm Mediterranean sun. Founded and still run by the Leali family, their philosophy is to create a concept of overall wellness. As part of this principle the whole resort has been designed and created with the aim of achieving full environmental sustainability. Taking inspiration from the local lemon houses, the hotel has been almost crafted into the hillside – think stone and wooden pillars, floor-to-ceiling windows and vegetation covered roofs. This respect for nature continues to the interior, where natural Italian walnut, olive tree wood and Italian marble create an airy and refreshing environment but at the same time evoke an extremely comfortable and luxe feel. Thermal energy is produced using a wood chip biomass plant creating an annual Co2 reduction worth about 510 tons. Rainwater is collected and used for the irrigation of green areas while solar and photovoltactic panels produce about 60% of the demand for electric energy. It’s eco luxury at its finest. 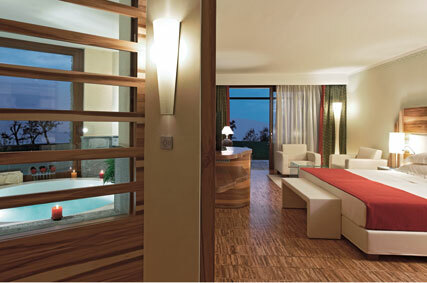 With just 90 suites the resort has an intimate and exclusive feel. We stayed in a prestige junior suite, the resort’s equivalent of a standard room, but trust us there is nothing common or standard about it. Wide and spacious in addition to the usual hairdryer, TV etc each room features a walk-in wardrobe, marble bathroom with both a bath and large power shower, a separate WC, minibar, writing desk and two relaxing seating areas – bigger than some of our friend’s entire apartments in London! Each suite also has a private balcony/terrace with a stunning view of the lake. This sublime view is even visible when lying in the bath thanks to a large window with an uninterrupted eyelevel view to the balcony. Perfect with a chilled glass of white wine in hand. Every little detail in the bedrooms has been thought of from an environmentally friendly point of view too, from the walls painted with chemical free water paint to the natural cotton fibered bed linen. Guests can also contribute to the resorts water saving policy by simply placing a wooden lemon symbol on the bed if they want their linen changed daily. A unique measure of the resort is to reduce guests’ exposure to electromagnetic fields by not equipping bedrooms with Wi-Fi. It also ensured we completely switched off at night by curbing our nightly iPhone email and social media habits. Guests at the resort ranged from stressed out business people (their hunched shouldered appearance didn’t last long) to glamorous couples, besotted honeymooners and large Italian families encompassing toddlers, teenagers and grandparents. The resort cleverly caters for all with both large family and romantic exclusive suites with private gardens and whirlpool tubs. Our days were spent indulging in pure, guilt-free relaxation. At the resort the SPA plays a key role in enhancing the concept of overall wellness. Lefay has worked with a team of internationally recognised doctors to develop their own innovative and exclusive Lefay SPA method, fusing the principles of Classical Chinese medicine with Western scientific research. Before beginning a spa experience each user meets with the in-house doctor for a personalised prescription of wellness treatments. Lefay has also created specific wellness programmes tailored to guests’ needs with the aim of restoring wellbeing and overcoming particular issues such as excess weight, tiredness and premature ageing. As well as treatments such as massages and acupuncture sessions, the programmes offer special dietary menus and activities from pilates to Qi gong and Tai’Chi. After an in-depth discussion ranging from sleeping patterns to exercise regimes and even childhood dreams, Doctor Corradin prescribed me a special herbal tea to be drunk three times a day and two treatments to tackle my blocked energy lines and relieve tension. My first treatment was a ‘Recurring Thought’ massage to correct my energy system and to strengthen the ‘Yi’ – my mental lucidity. The massage concentrated on my back, channelling my ‘light’ and ‘heavy’ energy lines. I drifted off into a state of deep relaxation with vivid lifelike dreams and awoke feeling refreshed with a much calmer mind and as a result a clearer train of thought. The next day I indulged in the ‘Alta Marea’ massage, aimed at flooding the body with energy by stimulating the Jing energy points. Afterwards as I reclined on the spa terrace sipping my delicious herbal tea I was overcome with a feeling of utter relaxation and happiness. It was like everything had clicked back into place and I felt the best mentally and physically I had all year. However, there was even more to come. That evening, we were treated to a private session of the SPA’s salt-water lake experience ‘La luna nel lago. In an underground darkened pool carved out of natural rock, we floated in the marine salt water, heated at 36-38 degrees Celsius, gazing up at the realistic full moon sculpture as our bodies absorbed the trace elements and minerals. A feeling of utter weightlessness rushed over us and emerging from the lake to lie on the salt benches my skin felt baby soft. And I can boast having been treated to the SPA’S own line of cosmetics including a purifying scrub and moisturing body milk containing Karitè Butter and Ceramides my skin has kept its enviable smoothness. When we weren’t being pampered by the amazing healing hands of the spa staff, we spent our time sunbathing, trying out the various saunas and working up an appetite swimming in the resort’s two outdoor salt water infinity pools. The food at Lefay is without a doubt exceptional. 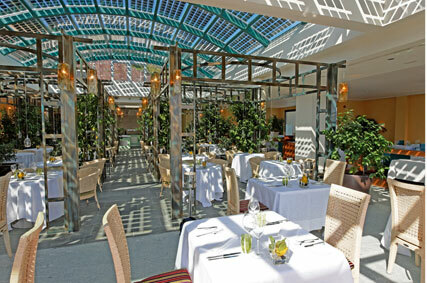 Offering a modern take on the Mediterranean diet, only fresh and seasonal local produce is used. Served buffet style breakfast had endless options. Each morning we were greeted with overflowing bowls of fresh fruits – plump cherries, juicy nectarines, zingy pineapple and tender apricots before wandering around the different sections debating between a hot breakfast – cooked to order in front of you, or whether to sample something from the more European style breakfast platters of cold meats, cheeses and sweet pastries. For lunch we ate at the resort’s ‘ Trattoria La Vigna,’ a pretty shaded terrace area naturally fragranced by potted lemon trees. An a la carte menu offered everything from pastas and risottos to a fresh fish of the day dish but our favourite option was to grab a plate and work our way around the buffet section. We were in cuisine heaven with bowls of roasted aubergines stuffed with sun dried tomatoes, crispy salad leaves, tiny baby tomatoes with sweet basil, platters of beef Carpaccio and meaty prawns, parma hams sliced before us and the creamiest balls of plump mozzarella and truffle infused hard cheeses. Not forgetting the fresh home baked bread selection which we dipped piece by piece in the smoothest extra virgin olive oil produced from the resort’s own olive farms. The resort’s staff were remarkable: friendly and attentive but not overly fussy. As the sun reached its peak at midday, pool waiters wandered from sunlounger to sunlounger handing out cold soaked eucalyptus hand towels and refreshing slices of watermelon. One evening I returned to find my newly bought novel placed on my bedside locker with a bookmark left on top. It’s this absolute attentive but unobtrusive attention to detail that makes the resort really stand out and even harder to drag yourself away from. But in need of postcards (mainly to brag about where we were) we jumped in the complementary resort shuttle car and headed down the hills to the picturesque village of Gargnano – the sailing capital of Lake Garda. After amusing the friendly locals with our attempt at Italian while searching for a post office we wandered off to explore the pretty, narrow laneways and watch the local fishermen hauling in their glimmering catches. For the more active the resort can advise and arrange sailing excursions, wind-surfing, scuba diving and bike rides. Our evenings were spent sipping a cool aperitif before making our way up to ‘La Grande Limoaia,’ the main restaurant where we dined by candlelight in the scented lemon grove. Stand out dishes included Catalan lobster salad, tender sirloin steak cooked to perfection and the most melt in your mouth ice-creams including passion fruit and pistachio not forgetting the most indulgent tiramisu. Delizioso! The wine list is as equally impressive and a charming sommelier tempted us with a delicious red wine from the local Bardolino region. Even those sticking to the healthier set menu will fail to feel deprived with options including lamb loin in a lemon and lavender sauce, sea bass Carpaccio and passion fruit crème brulee. The bar also offers an extensive cocktail menu which we sampled each evening after dinner while enjoying gentle music from a local piano player. Other times we took a nightcap back to our rooms to watch the large full moon reflecting in the lake, the only noise being the gentle hum of crickets. Simply magical. We’re already plotting a return visit. 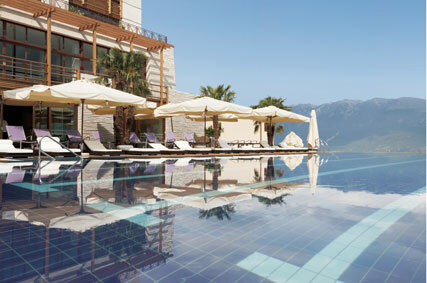 Kuoni (01306 747008 or www.kuoni.co.uk) offer three nights at Lefay Resort & Spa Lago di Garda in a prestige junior suite with breakfast, including economy flights with BA from London Gatwick with private transfers in resort. Prices for November/December 2012 from £626 per person, based on two sharing.